Social work professors recognize the need for technology to be an important learning tool in the classroom. Over the course of the past 20 to 30 years, the use of modern day technology—computers, the internet, social media, and more—has become an integral part of day-to-day life. "Technology is ubiquitous in our every day lives," says Anne C. Deepak, PhD, an associate professor at Monmouth University School of Social Work in West Long Branch, NJ. "From information and arts consumption and production to building and maintaining social networks to digital organizing and activism in real time, digital and social technologies shape our social environments and provide both possibilities and barriers to social, emotional, and community growth and well-being." In so much of what happens personally and professionally, technology plays a role. This includes education—for all students regardless of age, degree, and major. And yes, that includes social work education. Professors throughout the United States and abroad are weaving the use of digital and social technology into their curriculum, relying on it not only to help teach lessons and guide discussion but also to prepare their classes for the next step into the professional world. To understand the need of digital and social technology in the classroom, one must first understand what digital and social technologies are and how they're different. "Social technologies are designed to help people communicate with each other and to share content," says Laurel Iverson Hitchcock, PhD, MPH, LCSW, PIP, an assistant professor of social work at the University of Alabama at Birmingham, "while digital tends to be the content that you're sharing, such as photos or a video or a podcast." Together, the two are overarching, encompassing much of the technology used daily, if not hourly. Thus, it's not hard to understand that the first benefit of incorporating technology into a lesson is engagement. "[Technology] helps me to engage my students, because we're dealing with millennials. They are glued to technology," says Sanjana Ragudaran, PhD, a specialist professor at Monmouth University School of Social Work. Ragudaran employs live polls in her lessons to stimulate conversation and gauge opinion. "I may be talking about attitudes on child abuse and have a series of questions. We can see the bar chart go up and down [with responses to the polls] as the students text in their answers. This is an opening for me to talk about perceptions, to draw them into class." She notes with some humor that this form of engagement can be particularly helpful given the subject matter she teaches: policy. "They are usually dragging their feet," she says of incoming students. "They all want to be clinicians; why do they have to take policy?" Engaging the students well allows them to learn that lesson: policy informs practice. Paul Urbanski, PhD, MSSW, an assistant professor at Monmouth University School of Social Work, agrees that technology helps pull the students in and, he adds, widens their view while there. "It's something that students are becoming more and more engaged with, whether it be on social media or as a resource. There's a natural connection there," he notes. "It offers a huge opportunity to bring into the classroom people and places typically outside of the reach of most students. It provides an opportunity to provide genuine first-hand experiences." Technology can also help to make the subject matter available to students after both the class and their time in school. Jonathan Singer, PhD, LCSW, an associate professor at Loyola University Chicago and founder and host of the Social Work Podcast, began his podcast with just that in mind. "I asked myself: How can I create archival summaries of the content [from my classes] that students can have access to after they graduate and that they can listen to when they have time? How can I create something that they can learn from? And so the podcast is really the big way that I have contributed to the integration of social work education and technology." The podcast, which Singer says began as him reading through the PowerPoint presentations he had created for the classroom, has evolved into an interesting, engaging and more in-depth production that targets both current students and those continuing their learning in the field. In addition to engagement and extended learning, using digital and social technology in the classroom helps prepare students for being professionals. Similarly to how its use can help elicit discussion from students, technology can help social workers connect to and gain insight into their clients—not through Googling but through gaining knowledge about the resources available to and used by clientele, community members, and communities as a whole. "If we're going to be relevant," Nancy J. Smyth, PhD, LCSW, dean and a professor at the University at Buffalo School of Social Work in New York, says of the profession, "we must be willing to go in and explore different forms of technology." Smyth recalls a conversation she had with an alumna who had been looking for an aging care manager willing to use a Google document to communicate with her and her brother. The alumna's father was being cared for in a city separate from her own and this plan seemed to be a great way to stay up to date. "She went through five social workers before she found someone who was willing to do that," Smyth says. "We can't all know how to do everything, but when a client wants something that I can't do, I ask around and I find out how to do it. "Now, as an educator, I'm more concerned that we're not educating social workers enough on this." 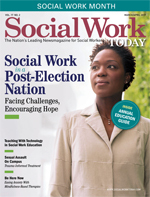 Before and while in the field, social workers must also know how to communicate and learn from the national and international community of professionals. Technology can be used to teach students as they enter the workforce networking best practices, showing them how best to communicate with and learn from what's available. In many ways, that means social media. "A lot of social workers are really scared of social media and how they present themselves online," explains Melanie Sage, PhD, an assistant professor and BSW program director at the University of North Dakota. "So they've taken the default position of 'I'm just not going to be online.' [But] if you don't create your own identity, someone is likely to do it for you." Teaching college students about their online identity can be more complex than some might anticipate. "There's this myth that the 20-year-old bachelor's in social work student is the digital native and is really proficient in the use of technology," Singer says. "There are some 20-year-olds who are, but even when you have a digital native who grew up using Snapchat or Twitter and who isn't used to a world where they don't have an internet device on their person at all times, they don't know how to use it professionally. "That can be harder. They're having to learn how to translate something that has been a personal mode of expression and translate that into being a professional. That is what we've all done: write professionally, be on the phone professionally. But if professors are ignoring the technology side or assuming that the 20-year-old who whips out her phone during break is automatically going to be able to use tech in a professional context, that's a problem." Knowing how important it is to incorporate technology into the curriculum can make the idea of implementing it overwhelming. However, it is also important to remember that technology takes many forms. The aforementioned professors have all found their own ways. Ragudaran uses live, anonymous polls in her classes. A former colleague had embedded poll questions in her PowerPoints. When Ragudaran saw this, she looked into what polling tool she could use, finding the Poll Everywhere app. "I stumbled upon the website, I signed up, and I did a dry run. If you practice on yourself, it really helps. And this is very easy to use." She uses the polls not only to find out how students perceive different topics but also to check in with them on whether or not they completed the readings and how they are feeling about their understanding of the material. Ragudaran is quick to note that she does not use the polls during every class—maybe six or seven times a semester with her undergraduate students. Using it too often could make it less fresh and interesting. For Urbanski, his use of technology is aimed at opening up the classroom, accessing guest speakers who may not have been able to reach the students otherwise. The farthest he's reached? Taiwan. Two students and a faculty member from National Taiwan University presented to Urbanski's class via Skype. "The students were presenting on two separate projects. One had been involved in the student democracy in Taiwan. She talked about the reason Taiwan is having this movement," he describes. "The other student presented on farmland. A number of farmers have been losing their land because large corporations have been buying up property. They were very different projects, but very, very powerful." The session involved both a presentation section and a question and answer portion. Thinking also of broadening their students' experience, Smyth, Sage, and Hitchcock often turn to Twitter. "We use Twitter assignments to share news with each other in the classroom," Sage says. "[We focus on] creating your professional image and where/how to find news and assess it for its accuracy. I believe that by doing this kind of work, we can start demonstrating how to use the tools." One of Hitchcock's favorite assignments is a Twitter chat. "In one of my upper level classes, I teach my students how to do live tweeting. We hold a live Twitter chat every Thursday evening, where we get on Twitter at the same time and talk about macro social work issues. A Twitter chat, Smyth explains, employs a hashtag. In the case of the Thursday night chat, which Sage and Smyth have participated in and Hitchcock regularly takes part in, the hashtag is #MacroSW. "You can pull up the hashtag and follow the dialogue," Smyth says. "There's a facilitator with some key questions that they're going to ask and a topic that's chosen. Often there's a blog post that provides background to/for the discussion. "Almost every time I've participated, I've found other people that I wanted to connect to," she adds. Hitchcock agrees. "Connecting with people all over the country that I wouldn't have necessarily interacted with—it's been incredibly empowering for me as an academic." In fact, Twitter is how Hitchcock, Sage, and Smyth met, and "#MacroSW," Hitchcock notes, "has developed from a regular conversation into an online community of social work practitioners and educators interested in macro-level practice. [The community] can be found at www.macrosw.com." Of course, one of the most encompassing ways that technology has come into the classroom is through online courses/degree options. Sage launched the University of North Dakota's online BSW program in 2016. "We're one of the first in the nation to offer undergraduate online," she says. "All of our classes are synchronous. Our students use web video and microphones. They log into a platform called Adobe Connect. In the Adobe classroom, there's a place to set up PowerPoint and set up a discussion board." Sage is able to break her students into smaller groups for discussions and presentations. And, in some ways, she's able to provide feedback on assignments more easily. For example, Sage teaches motivational interviewing both online and on campus. In both, she asks students to record themselves practicing motivational interviewing techniques. For her online students, Sage is able to rerecord the interview with a voice-over, pointing out positive aspects and room for improvement. "Students really like that kind of feedback," she says. All of these techniques, whether they be teaching tools, assignments, or educational programs, are simply examples of the many ways one can incorporate technology into a social work classroom. There are many more. Sage, Smyth, and Hitchcock are currently working on a book that will include a compilation of assignments. But knowing all of the options doesn't mean knowing how to incorporate them. How does a professor get started? Step one is to explore. "I would encourage a hesitant professor to spend some time exploring any topic they teach on through Facebook, YouTube, and a simple Google search. I have found that almost every advocacy group, nonprofit, and governmental association to be on Facebook with a fanpage," Deepak says. "Not only do these fanpages often share interesting videos and infographics that can be used in teaching, they also provide up-to-the-minute news and analysis from their perspective." In addition to exploring topics, professors should explore the tools available to them and their students, even if unsure of how or whether the resource will be used. When Snapchat first became popular, for example, Singer, Smyth, and a third colleague, Mike Langlois, LICSW, spent a weekend using the app. "It was great," Singer says, "because it gave me a chance to play with a technology that wasn't really developed for me." Second, connect. There are social workers at universities everywhere working to incorporate technology into their curriculum. Twitter is an excellent resource for this. "There's a small enough group on Twitter that you get to intermingle," Sage says, "but big enough that you get an interjection of other people's ideas." Google+ also has a community of social workers, including Smyth, Hitchcock, and Singer. "We have a fairly strong Google+ social work and technology community," Hitchcock says. "We have people from all over the world. It's a really nice way to share ideas and get feedback." And above all else when trying something new in a classroom, Urbanski urges, "become very, very friendly with the tech department." — Sue Coyle, MSW, is a freelance writer, a social worker in the Philadelphia suburbs, and a frequent contributor to Social Work Today.